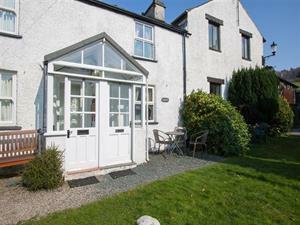 Jasmine Cottage Self-catering Jasmine Cottage is a pretty character property nestling quietly within the oldest part of Troutbeck Bridge in a small enclave of character properties dating from the 18th century mid-way between Ambleside and Windermere. The area is very popular with holidaymakers seeking a quiet location well away from passing traffic but with all the main Lake District sights easily to hand. With a well stocked local shop at the bottom of the lane, footpaths from the door up the hill to Troutbeck, and many opportunities to tour by car or bus, you will be well placed to enjoy the Lakes in any season. Accommodation: Part of the charm of this cosy cottage is its size - small but carefully planned to make the most of modern day living whilst retaining the character and feel of a bygone era. You enter the cottage from the back door into the open kitchen/living room which has wooden flooring. The well equipped kitchen leads through to the sitting area (flat screen TV/DVD with Freeview,Plusnet Wi-Fi, CD player/hi-fi and log burning stove). The bathroom is to the back of the cottage (bath with shower over, basin and wc). Upstairs offers two bedrooms - a double with pretty views and a single (room for a cot). Deep set windows and thick stone walls are a real feature. Outside: Room to sit outside the cottage - garden furniture provided. Private parking for one meduim car. Small outbuilding 30 yards from the property ideal for storing bikes etc.. Village shop, bus stop and pub within walking distance. Jasmine Cottage offers weekly bookings starting on Friday. All bed linen, gas & electric included. Fuel for open fire available locally. Free membership to Low Wood leisure club.